Silk Brides is a couture design studio located at Varsity Lakes on the Gold Coast. Silk Brides specialise in exclusive wedding dresses and designer bridal wear for the entire bridal party, including mother of the brides, bridesmaids and flower girls. Head designer and owner Elena Wille offers a personalised couture experience to ensure every bride looks beautiful - and feels comfortable and confident - on her wedding day. Elena Wille is one of the Gold Coast's leading couture bridal wear designers. She is renowned for her beautiful gowns and impeccable taste. Her unique signature is one of balance, style and sophistication. Silk Brides uses only the highest quality fabrics and luxurious embellishments in the creation of their wedding gowns. Silk Brides is a 'must see' studio for every Gold Coast bride. Conveniently located in the centre of the Gold Coast, Silk Brides is just 5 minutes drive from Robina Town Centre. Contact Silk Brides for a complimentary bridal consultation. A Silk Brides couture wedding gown is created with passion and precision. All dresses are handcrafted at the Silk Brides Gold Coast studio. Every gown is individually designed to flatter and enhance. An exclusive Silk Brides couture design ensures every bride looks beautiful and elegant on her big day. A Silk Brides 'couture bridal experience' guarantees the bride many unforgettable memories in the preparation of her wedding dress. A couture wedding dress is a one-of-a-kind bridal gown that is exclusively made to measure. Every aspect of the wedding dress is uniquely designed and created by hand. Any style of wedding dress can be created upon request. A couture wedding gown ensures a perfect fit and flattering style for every bride and bridal party member. 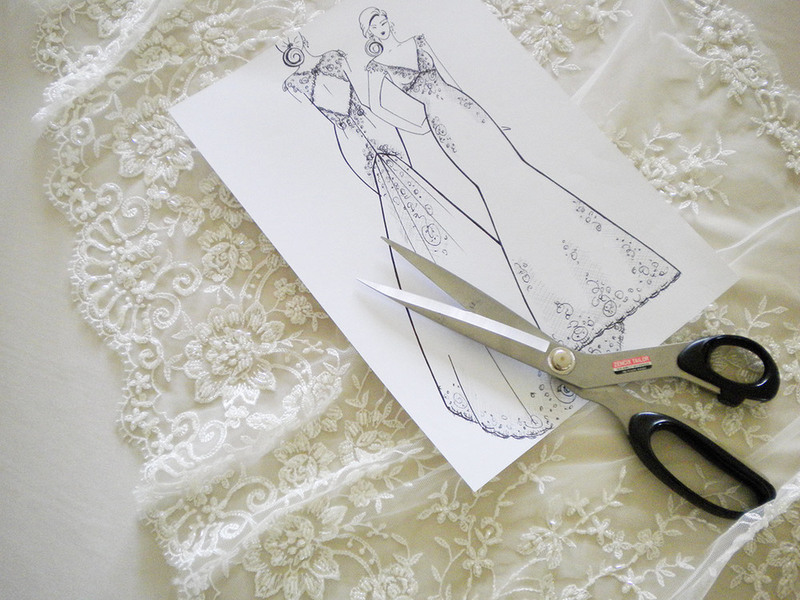 The Silk Brides couture design process consists of 4 main stages. After an initial consultation with Elena Wille, discussions are held to refine the style, detail and fabrics for the wedding dress. An initial wedding dress design is developed. Concepts are fine-tuned and a final design sketch is developed for review. After the wedding dress is designed, sizing measurements takes place at a measuring appointment. From these detailed measurements, a paper pattern is cut. From this pattern a calico toile is made. The calico toile is a detailed mock up of the future wedding gown. The calico toile is fitted in a personal fitting session. Great care is taken to make detailed adjustments to ensure the most accurate fit. The toile is perfected - and any design modifications incorporated - before the silk fabric is cut out. The fitting of the completed wedding dress requires several sessions dependant upon the style and fabrics. Silk Brides strives for a perfect fit to the highest standards. The last fitting will be held close to the actual wedding day to ensure all details are in place for a stress free ceremony. If you are interested in learning more about couture wedding dresses, please visit Silk Brides. We have a large range of ready to wear bridal gowns also available for viewing. To make an appointment call Silk Brides today!